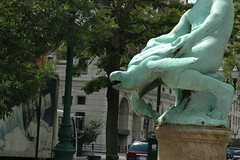 Turtle Boy Statue, originally uploaded by Claudia Snell. Alright all you naughty minded people – and you know who you are…. haha! This is the famed Turtle Boy statue of Worcester, MA. It seems that a lot of people are into checking this thing out (if my stats and image views are any indication). For those who are not from Worcester, MA, this is a statue that used to be a fountain. It’s located in downtown Worcester, Salem Square, at the edge of the Common. It’s also a bit of a conversation piece. I think you can see why people would be talking about this thing, and giggling a bit too. It was a gift to the city by Harriet Burnside. Poking around I found info stating that she gave the city $5000 in 1905 to have a fountain built. It’s original purpose was a water trough for dogs and horses but now it’s just a monument, no water. It’s not a big deal since nobody rides horses around in Worcester anymore. The fountain was designed by Charles Harvey and Sherry Fry and was completed around 1912. I know – boring stuff compared to what people usually say about the statue – it doesn’t take much of an imagination to guess what sorts of comments are made so I don’t need to go there. I’m sure Harriet Burnside and the designers didn’t have anything naughty in mind when they first created this. 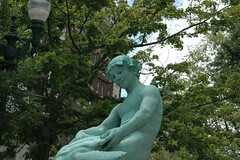 More information about the statue is available on the Worcester DPW site and also on Art Inventories Catalog site. There’s also a good piece here. Bancroft Tower – This is a monument that also has some naughty things said about it.Hurstwic – Viking Age Living History Society – Not at all naughty but very interesting folks.Higgins Armory Museum & the Higgins Armory Sword Guild – also not naughty, sorry.. but they do have cool swords.My HUGE flickr.com collection of Worcester, MA pictures. It’s got all sorts of places, festivals and other stuff. This post was picked up by Worcester Magazine’s Blog Log. Check it out, see what the Worcester Blogosphere is talking about @ Worcester Magazine. The “Blog Log” is under “Opinion”.